For the last 5 years, there has been one state at the forefront of the marijuana industry, our home state of Colorado. In our pioneering state the Dab reigns king and behind every honey golden dab, there is an Across International Oven. With sizes from 0.9CFM to 16CFM and compatible pumps from EasyVac, Welch and Edwards The Trimmer Store has all of your degassing oven needs covered. The Trimmer Store would like to introduce the all new 2017 Across International Accutemp 1.9 cubic foot vacuum ovens (110V only), come standard with Stainless steel tubing, Stainless steel vacuum & vent Valve, oil-filled vacuum gauge, 5 sided pad heating technology. 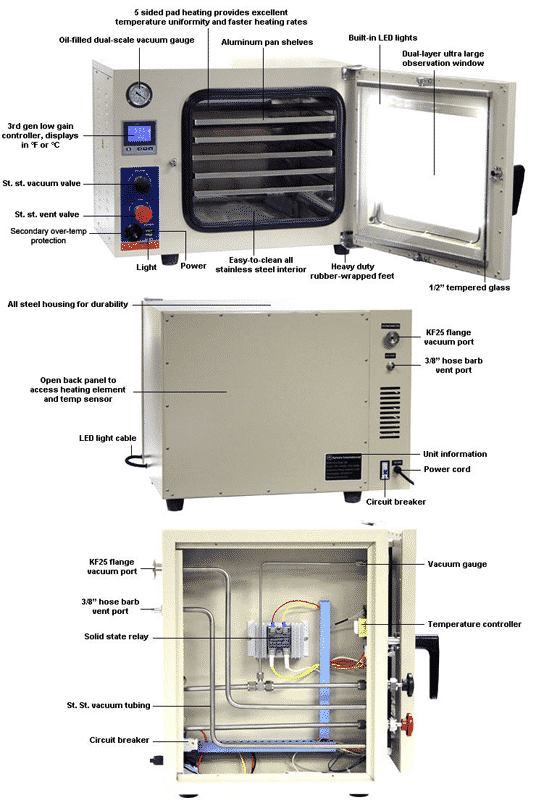 The thermal-conductive aluminum pan shelves provide excellent temperature uniformity inside the Chamber, while the standard is the 3RD gen LCD low proportional gain temperature controllers keep your Oven temperature within /- 1°f accuracy, in either °F or °C. The new 2017 model comes standard with five aluminum shelves but is capable of holding 10 shelves. Stainless steel internal tubing provides higher vacuum, holds vacuum 10 times longer, and require minimum maintenance. Oil-filled mechanical vacuum gauge provides more accurate reading, longer gauge life and reduces the risk of damage. Stainless steel vacuum and vent valves give you cleaner connection, more accurate control and increased pump longevity. 5-sided pad heating technology and aluminum shelves provide excellent temperature displacement and quicker heating rates. LCD display now in included. Adjustable gas backfill capability with needle Valve and a vent port. Productivity and allowing for the production of superior quality products with minimal processing time.